The more I think about this move to Denver the more I realize what a major change it's going to bring. To everything. Mostly good change. At this point finding a (good) job is my major concern. But that won't be a concern of this blog. Running will remain the focus. My running is going to change in the most fundamental ways possible when we move to Denver. We'll be living at an elevation of about 6,000 feet, which is enough to feel in the lungs. Eventually we may wind up in a neighborhood as high up as 7,000+ feet, which is definitely enough to feel. To the west--an easy drive away--will be mountains as high up as 14,000 feet. This is the ultimate running country. Fast running like I do here in Cleveland with mile repeats and long tempo runs will become shorter but still intense efforts. Whereas I've always believed deeply in the hard mile repeat, I may need to adopt a new ritual of 800-1200-meter repeats. Long tempo runs may have to become fartlek workouts. And then there are the mountains...to see, explore and summit. I have decent speed and can burn pretty well, but ultimately I'm a hill runner. The Mohican Trail 100 is a hill race--23,000 feet of up and down hills that beat the tar out of you. Just because I won the 2009 Mohican 100 doesn't means I can do it on the mountains. Hills aren't mountains. In many respects I'll have to learn to run all over again as I become a mountain runner. It's hard to say what that will be like for me. It's going to take several months for me to acclimate to the elevation. At first I'll run some peaks south of 10,000 feet and try to get used to my surroundings, the big climbs and the thin air. I'll take on more and more with time, especially if in fact I do the Leadville Trail 100-Mile this August. Leadville will be a major challenge. It's run at elevations of 9,000-12,000 feet. And then there's the big, bad Hardrock Hundred down in Colorado's San Juan Mountains. No 100 is more difficult than the Hardrock. 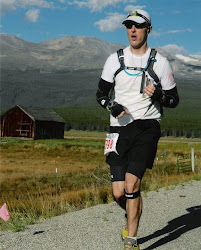 1) Doing either the out or the back on the Leadville 100 course. This will require some transportation aid from my wife, Anne, and plenty of logistical planning. I know Anton Krupicka does this run quite a bit. I can't wait to do it myself. 2) Summiting Pike's Peak. I plan to join the Incline Club for some runs. As I understand it, they run in the Pike's Peak area. I cannot wait to stand atop the great peak. But getting to the top--I think it's at about 13,000 feet and climbs 7,000 feet over 13 miles--will require much of me. I'll need to acclimate for a while before taking on Pike's. I'm not sure what living at elevation is going to do to me as a runner. Are my days of sub-3-hour marathons done since I won't be able to run fast for long periods of time? Or maybe the thin air will actually make me even faster if I run a sea-level race? 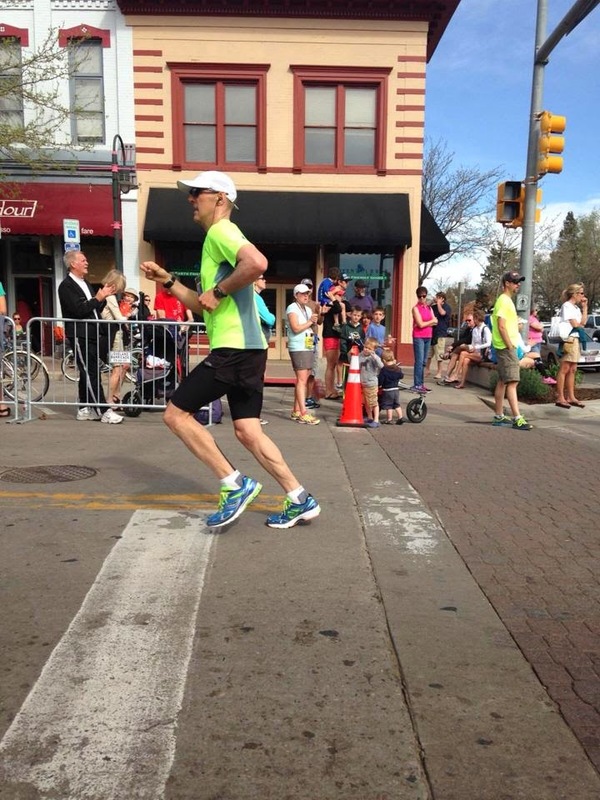 I know Matt Carpenter, the great mountain runner who lives in Manitou Springs, has a marathon PR of 2:19, but he's a freak of nature whose genetics simply don't apply. I have no shot at such a time, but maybe once I acclimate my goal of a sub-2:50 will become a reality. The key, I think, to this move is remaining patient in my running. The altitude is going to be an adjustment. I wasn't able to sleep well during our visit to Denver a month ago (a common altitude issue) and I definitely felt the thin air in my lungs during a few runs. I'm going to have to remain patient and know that acclimating will take time. Eventually my red blood cell count will increase and my body will adjust. Until then, I'll just have plenty of fun seeing, exploring and experiencing a whole new world. I have news to share. I guess the title of this post is a dead give-away. After five years of living in Chagrin Falls, Ohio, my family and I are moving to Denver, Colorado to pursue new career opportunities. We'll be in Denver this spring. It's hard to believe we're heading West. This move has been coming for well over a year, but our final decision was made only a few weeks ago. My wife, Anne, a (brilliant, talented, dedicated and I don't mind saying beautiful) board-certified veterinary internist, has found a wonderful opportunity at a growing private practice in Parker, which is just south of Denver. Anne, who went all the way in her specialty training (4 years of internship and residency training PLUS an additional year as a clinical instructor at Purdue University BEYOND the standard 4 years of veterinary school) will enjoy a supportive, family-friendlier environment and a growing clientele, making this a great move for all of us. I am looking for a full-time position in development (aka fundraising) and will certainly miss working at University Hospitals, my employer for the past three years. Words cannot describe how much we will miss life in Chagrin Falls and Cleveland. This is where our son, Noah, was born and took his first steps. We both have very dear friends here. Contrary to conventional wisdom (which is often wrong, by the way), Cleveland is a wonderful place to live. It's an even better place to run. As I've written many times before, we have beautiful parks, hundreds of miles of trails of all varieties, a supportive and vibrant running community, premier races like the Burning River 100-Mile Endurance Run, and excellent running clubs like the Southeast Running Club. The winters are tough here, but you're rewarded with gorgeous springs, summers and falls. There is so much I'll miss. I'll miss Chagrin Falls, which is a one-of-a-kind town you won't find anywhere else. It's what towns across America try to copy and fail miserably in doing so--because you can't copy charm, authenticity, friendliness, character and soul. You can't copy the Popcorn Shop, Chagrin Hardware, Yours Truly, the peaceful country roads, the village falls, the Sunday afternoon cone-lickers, the Main Street hill, the Halloween pumpkin role, the gorgeous old homes, etc. This is a special place that we'll miss dearly. And I'll miss my job. I am so fortunate to work at University Hospitals. UH has been incredibly supportive of me as an employee, family guy and runner. One of my closest friends is also my boss. That says it all about my feelings for UH. I'll miss the Southeast Running Club and the greater Northern Ohio running community. When I joined SERC in the spring of 2005, I was still relatively new to long-distance running and ultrarunning was just something I'd heard of until I started talking with guys like Steve Godale. Ultras are now my passion. Five years later, I've achieved many goals, such as breaking 3 hours in the marathon, completing my first ultra, finishing a 100-miler, ultimately winning a 100-miler, and more recently completing a 24-hour race where I raised money for Rainbow Babies & Children's Hospital. I didn't achieve these goals on my own. I have many in the club to thank for their support and inspiration. I will miss the Mohican Trail 100-Mile community. If you've been a part of Mohican as a runner, volunteer or crew member, you know what I mean. Winning Mohican in 2009 was one of life's greatest moments. I am saddened that I will not be back in 2010 (more on that below). With this move to Denver, basically of my 2010 racing plans are changing. I will not be running in the Boston Marathon as it will conflict with our move. I will not be returning to the Mohican 100 to defend. I will most certainly not be competing in the Buckeye Trail 50K and likely not in the Burning River 100. My top objectives are pulling off this cross-country move and finding a good job. Through it all, I'm going to try to stay in shape with a potential goal of the Leadville 100 in August. It might be that 2010 will be a year off for me, but maybe not. I'm not getting any younger and I'm on the backside of my athletic prime. Right now I can run a lot of miles and ask a lot of my body. One day that won't be the case. So a year off is kind of a tough pill for me to swallow. We'll see what's next. Denver is a wonderful place to live, work and run. 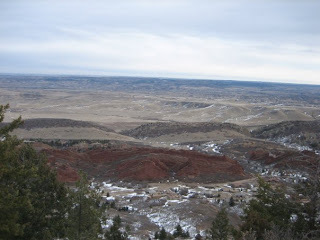 We returned from a visit a few weeks ago and loved what we saw, especially the Rockies. We're looking at many areas to live, including Castle Rock which is pretty close to Colorado Springs and offers magnificent views of Pike's Peak and the mountains to the west. We'll be living at an elevation of about 5,000-6,000 feet with pretty easy access to mountains as high up as 14,000 feet. We've driven through neighborhoods that are at 7,000+ feet. It will take many months to fully acclimate and adjust my approach to running. My dreams of running in the Leadville 100 and even the Hardrock Hundred will eventually come true. I'm talking with members of the Rocky Mountain Road Runners Club, the Incline Club (founded by Matt Carpenter), and the Denver Trail Runners. I can't believe we're going out west. When people hear Denver, they say, "You're going to love it! It's beautiful and life there is so good." While that may be true, leaving Cleveland, which we consider our home, is painful and a little scary. But this move and the new life that awaits us are are going to be exciting. There will be many new possibilities. A long time has passed since my last post. Life has kept me very busy these past few months. In fundraising, the end and beginning of each year are very hectic times. Not to make excuses, but my job has kept me busy. And life has kept me busy. 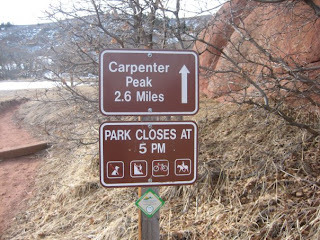 A sign to Carpenter Peak in Little, Colorado. Elevation 7,300 feet. Beyond work, there is so much on my mind right now, and honestly I lost focus with my running and am only now regaining some sense of direction. That’s a good thing. It’s now February, the spring is approaching and I certainly want to be in super-good shape for a competitive racing season. My schedule for 2010 is pretty up in the air. I’m still trying to figure out what races I’m going to run. 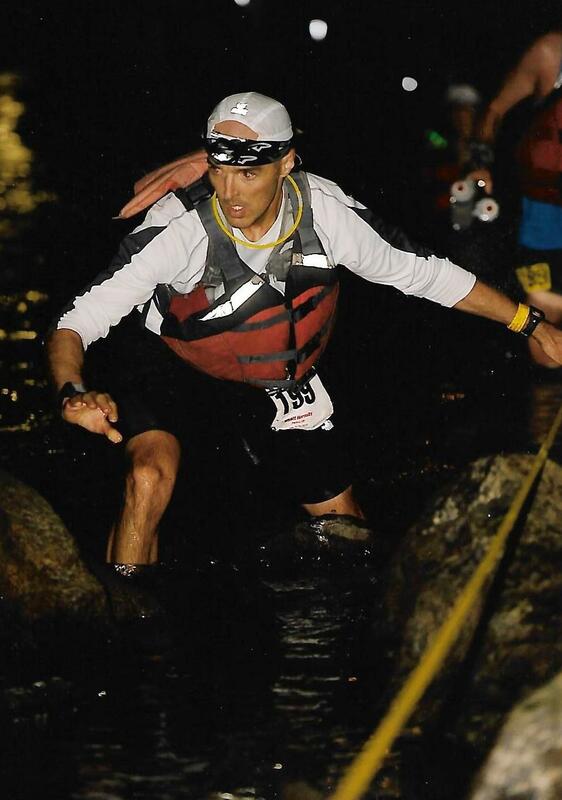 I want to defend at the Mohican Trail 100 Mile Run but honestly the Burning River 100 Mile Endurance Run, which is hosting this year’s USATF 100-mile national championship, is alluring. Both are Ohio races and I know both courses well, but I know the BR100 course very well. Despite a lack of focus these past few months, I’ve stayed on target with my mileage. I ran 70 miles per week throughout December and January and, with it now being February, have increased my output to 80 miles per week. Last week (1/25-1/31) I put in 81 miles and this week I’m projected to hit 85 miles. More importantly, I’m seeing great improvement in my weekly tempo runs and am doing my best with intervals despite treadmill speed limitations (maxes out at only 6:00/mile) and slick roads due to the snow and ice. I’ll stay in the 80s throughout February and then up the mileage to the 90s in March and—oh yes—100s in April, May, and beyond. Last week we got back from a trip to Denver, where we visited with friends. 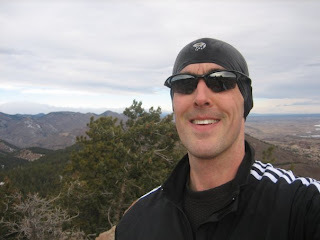 Although we kept a very busy schedule, I did manage to get away for a little while on Sunday morning and run Carpenter Peak in Littleton’s Roxborough State Park—elevation 7,300 feet. That’s the highest elevation I’ve ever run and this was my first time in Denver or ever seeing the Colorado Rockies. The Rockies are spectacularly beautiful. I saw “rocky mountains” in Eastern Europe when I was an exchange student in college and I’ll never forget the site, but not since I saw the Colorado Rockies a few weeks ago have I seen such beauty. My Carpenter Peak run was a penultimate running experience for me. I had the time of my life and reaching the top—with its beautiful views—was an awesome experience. I’d love to someday get to the top of one of or many of Colorado’s 14,000-foot peaks. Making my way up to Carpenter Peak. I’d always pictured Denver as a mountain city. In reality, the city itself is on relatively flat and in some places hilly land—albeit high-up land (5,000-6,000 feet)—with the mountains just west and to the south. They are always on the horizon. It’s an extraordinary site. I can't imagine what the early pioneers must have thought as they made their way across the plains--huffing and puffing from the high altitude--and then suddenly saw these gigantic mountains far off. "Damn, we have to get past those things--but how?" they must have said. In these mountains legendary races like the Leadville 100, Hardrock Hundred, Pike’s Peak Marathon, Imogene Pass and other events are run. 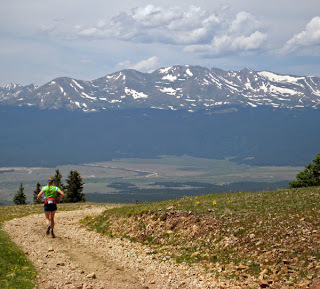 I dream of running Leadville and Hardrock one day…and maybe Pike’s Peak and Imogene. Living at sea level as I do, those races are a tall order. At the top of Carpenter Peak. The sites around me were beautiful. I was quite sick the week before we visited Denver and managed only 41 miles. I missed three whole days of running (Monday, Tuesday and Wednesday). Puking 10 times and missing a night of sleep as a result of a violent stomach bug takes a toll on you. I’m over it now and honestly I think the three days of not running did my body some good. I felt great last week as I did 81 miles and so far this week I’m A-OK. I now realize that it took me a long time to fully recover from the North Coast 24-Hour back in early October. There’s a rule in distance running that I used to doubt but now think may actually be true. For every mile of a race you run, factor in one day of recovery. As I did 131 miles at the NC24 on Oct. 3-4, that means I needed 131 days—or just over four months—to fully recover. I’m now almost at 131 days. My left knee is still not 100% but is much better. I didn’t realize until very recently, when I actually started to feel good again, just how messed up I was for so long after the 24-hour. The immediate effects of the race—skin and bones from the fat burn (I looked like Skeletor after the race—just ask my wife), a shut-down digestive tract, a week of indigestion, zero appetite for three days, off-the-charts tiredness, badly damaged feet and toes, and a totally messed-up knee, heel, and arch—were only a prelude of what was to come: a very beaten up body and soul and the threat of burn-out. I’m glad the damage is now behind me. All for the better; I am a 100-mile trail runner and marathoner anyway. Now, for a closing thought. I’m not sure what came first: my belief in myself when the cards are down, or my love of ultrarunning. Did ultrarunning force me to believe in myself, or am I an ultrarunner because I believe in myself? It’s the chicken and egg argument. Anyone who’s put themselves out there and run a 100-miler or 24-hour or some other super-long race knows what it’s like to have run all day and night and faced down and ultimately overcome enormous doubt stemming from physical, emotional and spiritual anguish. As you shuffle along, the lights are off and you’re in a dark tunnel. The eyes of evil are fixed on you and demons are swirling around. In the face of such dread and despair, you believe in yourself and find strength from something far greater than yourself—God, in my case, but maybe something else in yours—and you prevail. The finish line and the buckle are not only rewards for persevering, but also a reaffirmation of your own humanity and strength. If you’re a dedicated ultrarunner, you’ve experienced a level of living few ever have—voluntary suffering in the search of something deeply personal revealing the basest elements of humanity and a spiritual rebirth. An achievement many call extraordinary and super-human only makes you realize how human you are and a humble person at that. Here’s to the greatest sport of all—ultrarunning.